Note that there is no relief from the footprints of animals or birds, which is a common misunderstanding. Also, remember that there is no relief from interference by an abnormal ground condition when the ball lies in a water hazard or a lateral water hazard, Rule 25-1b. I previously blogged on the important subject of ‘Known or Virtually Certain’ at this link. To summarise, the possibility that the ball may be in an abnormal ground condition is not sufficient; there must be preponderance of evidence to that effect. Even when the weight of evidence suggests that a ball is lost in the condition, but there remains a possibility that it could have come to rest outside the defined area, the player should strengthen the evidence by searching for their ball for the permitted five minutes. In the absence of strong evidence that the ball is in the condition it must be treated as lost, and the player has to return to where they last played from under penalty of stroke and distance (Rule 27-1). There is no alternative if the player wishes to play out the hole, which is a mandatory requirement in a strokes competition, but not in a Stableford, Par or Bogey competition. When it is known or virtually certain that a ball is lost in an abnormal ground condition, the reference point for taking relief is the spot where the ball last crossed the outermost limits of the abnormal ground condition. Having determined this point the player must then drop a ball in accordance with Rule 25-1c, which will depend on whether the reference point is through the green, in a bunker or on the putting green. Obviously, the reason why free relief is available for balls that cannot be found in ground under repair, is that they are areas of temporary adverse course conditions defined by Committees (Rule 33-2a(iii)) and it would be unfair if a player had to take a penalty of stroke and distance because their ball was known to have come to rest in one. However, remember that the same relief applies to balls that are known or virtually certain to be in other abnormal ground conditions, including casual water, holes made by a burrowing animal and, where defined by a Local Rule, environmentally sensitive areas. One last point, when a ball is found within an abnormal ground condition it is not mandatory to take relief, unless a Local Rule requires it. You will note in the excerpt from Rule 25-1c above that I have highlighted the words, “may take relief”; it does not say “must take relief”. Why not test and improve your Rules of Golf knowledge by working out players’ scores in completing 99 holes of golf, during which multiple Rules situations occur, some of them incurring penalties and some of them permitted by the Rules? My ‘How Many Strokes’ eDocument is fun and educational. Click here. Barry, we currently have a large expanse of GUR following drainage work. The ball goes straight in from the tee and lands in the middle of the GUR 200 yards away. We can see the ball but it would be dangerous to retrieve it, so it seems unfair to take a drop near the tee box. Should the player be allowed to drop at the nearest point of relife ie about 200 yards down the fairway? Thanks for any advice because it does not seem to be covered in the rules. Providing you are able to see the ball in GUR and can positively identify it, because you were able to see the ball throughout its flight to the point where it came to rest, then the correct place to drop a ball is within one club-length of and not nearer the hole than the nearest point of relief. The only time that you would use the point where the ball last crossed the margin is if the ball was lost in GUR. Check out Rule 25-1b. It is absolutely certain that the ball plugged in this "soft" ground area & cannot be found. Can relief be obtained locally or must the player take stroke & distance. I do not see anything concerning abnormal ground conditions as being open to interpretation. Decision 25/1 clarifies that soft, mushy earth is not casual water, unless water is visible on the surface before or after the player takes his stance. If a ball cannot be found in 'soft' ground it is obviously lost and the only way to proceed, if a provisional ball has not been played, is to play another ball under penalty of stroke and distance. Hi Barry, Can you please advise on a situation where an area of compulsory-drop GUR is adjacent to another, non-compulsory abnormal ground condition (e.g. casual water surrounding the GUR)? The area of casual water surrounding the GUR is extensive and the player in the compulsory drop GUR would prefer to drop into the adjacent casual water rather than the nearest point of total relief, which is some distance away. Is this permitted? R25-1 says "When the ball is dropped within one club-length of the nearest point of relief, the ball must first strike a part of the course at a spot that avoids interference by the condition". Yes, the the player must determine the nearest point of relief from the GUR, where taking relief is mandatory, and drop their ball within one club-length of that point, not nearer the hole. If the ball comes to rest in a position where there is interference from casual water they may then choose to play the ball as it lies, or take relief from the abnormal ground condition. Thank you for your explanation regarding ball lost in casual water. Further to this scenario, what if the casual water was an extension of the water hazard (caused by heavy rain), and we were not certain if the ball lay in casual water or inside the hazard boundary? My situation today was, from the tee, about 200 metres out and after two bounces my ball rolled (at speed) into water. The usual lateral water hazard had casual water extending outside the hazard boundary by about 6 metres. My playing partner and i agreed it was very likely my ball had not reached the actual hazard boundary line and lay in the casual water, so i took relief without penalty. I was later advised this was wrong and i should have taken a penalty, but there was no evidence supporting the theory my ball had reached the hazard. We had more reason to conclude my ball was in casual water than in the hazard? Who is correct? Q. 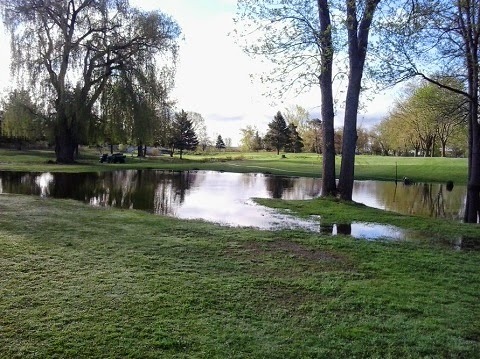 It is known or virtually certain that a ball is lost either in a water hazard or in an area of casual water overflowing the hazard, but it is not known which. What is the proper procedure?